If you’re in the market for a large and powerful sedan, take a closer look at the 2019 Chrysler 300. It shows off bold American styling and modern tech features, making it a top choice in the full-size sedan segment. 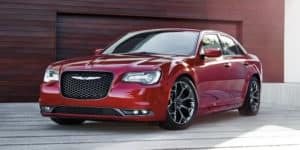 The 2019 Chrysler 300 is a large sedan that comes in five trim levels. These include 300 Touring, 300 Touring L, 300S, 300 Limited, and 300C. From the outside, standard features include heated side mirrors, an oversized front grille, and sharp edges that will certainly turn a few heads. With rear-wheel drive, the base trim also has 17-inch wheels, while all-wheel drive comes with an upgrade to larger 19-inch wheels. Exterior features on the higher trim levels include 20-inch wheels, LED fog lights, and adaptive Xenon headlights. You can further upgrade the outside of the 300 with optional packages. Features built into these packages include blacked-out exterior trim elements, chrome accents, and remote engine start. Within the cabin of the base model, you’ll find appealing features, like keyless entry and ignition, a leather-wrapped steering wheel, dual-zone automatic climate control, and an eight-way power adjustable driver’s seat. You can also get leather upholstery, heated and ventilated front seats, heated rear seats, a power passenger seat, driver’s seat memory settings, heated and cooled front cup holders, and a heated, power-adjustable steering wheel on the higher trims. On the tech side, standard equipment includes Android Auto and Apple CarPlay smartphone integration, a six-speaker audio system with satellite and HD radio, two USB ports, Bluetooth connectivity, and an 8.4-inch touch screen. Options include a 10-speaker Beats sound system or a 19-speaker Harman Kardon sound system. Beneath the hood of the Touring, S, and Limited trim levels, you’ll find 3.6-liter V-6 engine that makes 260 pound-feet of torque and 292 horsepower. In the 300S, the same engine puts out 264 pound-feet of torque and 300 horsepower. If you opt for the top 300C trim level, you’ll get a 5.7-liter V-8 engine, rating at 394 pound-feet of torque and 363 horsepower. Both engine options pair with an eight-speed automatic transmission. Rear-wheel drive is standard on all models, although all-wheel drive is an option on all trim levels except the 300C. For a more comfortable ride, choose the top trim level, which comes equipped with a touring-tuned suspension. When you’re transporting precious cargo, you’ll want to make sure your vehicle has all the latest safety features. Every trim level comes equipped with a rearview camera, anti-lock brakes, air bags throughout the cabin, and stability and traction control. On all but the base trim level, you can add the SafetyTec Plus package, which has front and rear parking sensors, blind spot monitoring, adaptive cruise control, automatic high beams, lane departure warning and prevention, rear cross-traffic alert, automatic wipers, and forward collision warning with automatic emergency braking. Test drive the 2019 Chrysler 300 at Westgate Chrysler Jeep Dodge Ram to experience these features for yourself. You’ll love the powerful engine options and stylish appearance that help you stand out on the road.